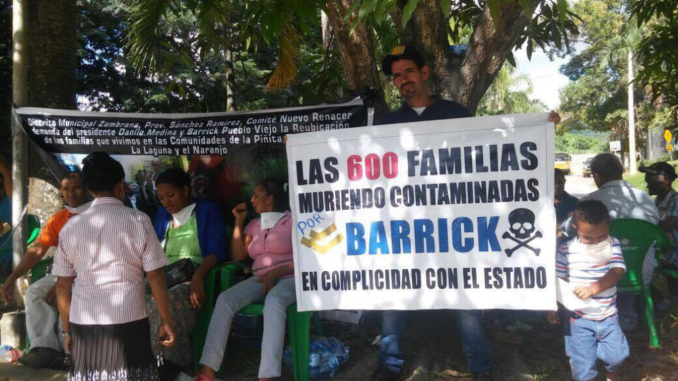 “600 families dying contaminated from Barrick in complicity with the state.” Photo provided by community member. After years of attempts for dialogue with little response from the company, community members have taken direct action. Since the early hours of Nov. 6, they have occupied space outside of Barrick Gold’s production site. Armed with signs, pollution masks and their voices, community members have chained themselves to chairs, refusing to leave until the demands of relocation for more than 600 families impacted by the project are met. Unfortunately, communities in this area are not unfamiliar to such struggles, as mega-mining on their land dates back to the 1970s. The zone in which Pueblo Viejo now sits was historically a small mining site, state-run from 1975 until 1999, by company Rosario Dominicana. The operation was shut down due to mismanagement and lack of financial resources. However, the company’s operations exposed enough sulfide ore to initiate acid mine drainage which left a community water source, the Margajita River, in an acidic state. Although the mine was closed, community suffering did not end. When Barrick acquired the site in 2006 they invested close to $4 billion in updating the extraction method to a process called pressure oxidation, which uses the four largest autoclaves in the world. This new technology allows them to extract gold from low grade ore that Rosario Dominicana could not. However, this new extraction process is extremely resource intensive and uses industrial quantities of cyanide in the process. In light of allegations that the company is shirking its stated corporate social responsibility mandate, Barrick tries to pass the blame by stating that the current concerns of communities are a result of contamination caused by Rosario Dominicana’s previous operations. However, community members strongly disagree. 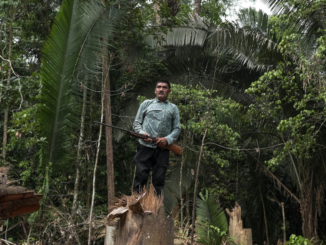 The communities insist that the impacts of mining have significantly worsened since the Barrick began operating in the area. The government’s insufficient records of water samples in the area leaves the communities with no baseline for analysis, which is how community members believe Barrick is avoiding accountability. However, the environmental impacts of open-pit mining are undeniable. Open-pit mining involves excavating and relocating large amounts – in some cases entire mountains – of surface earth and the underlying “waste rock” in order to expose the desired ore. Once removed, the ore is crushed into a powder-like consistency and showered in cyanide to dissociate the gold from the rock. This method poses far-reaching environmental dangers as approximately 79 tons of waste are produced to extract just one ounce of gold. Barrick claims that they have the ability to process a combined total of 24,000 tons of ore per day using industrial quantities of cyanide, leading to 1 million ounces of gold per year. Another cause for concern regarding community pollution is a potential spillage of the acid mine drainage within the tailing ponds. Tailings ponds are historically known for overflow and cracks, allowing toxic substances to leak into local water sources. The devastating impact of cyanide is recorded in a spill in Romania in the year 2000 where a tailings pond leaked cyanide contaminated water and heavy metals into local river systems. This spill caused extensive pollution throughout Romania, Hungary, Serbia, Bulgaria, and the Black Sea. 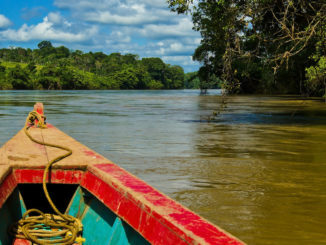 The threat of such a spill at ‘Pueblo Viejo’ is a major concern, as the Dominican Republic is small enough to fit into Romania six times. This fear almost became a reality last November when the “El Llegal” tailings pond rose to what community members believe to be dangerous levels after heavy rainfall in the area. One community members shared that although mine employees were evacuating due to a “red alert” and sirens, families living directly below the tailings pond were not informed as to what was occurring. Since then, communities have created a security system in which members do overnight shifts to ensure that, in the case of a spillage or disaster at Pueblo Viejo, they will have enough time to inform and evacuate the families in the area. Although over 75 percent of the world’s mining companies are headquartered in Canada, the Canadian government refuses to impose any sort of environmental or human rights regulations on Canadian corporations functioning outside of the country. A poignant example of this is the failure of Bill C-300, “Corporate accountability for the activities of mining, oil, or gas corporations in developing countries,” which was a small step towards corporate accountability proposed by Liberal John McKay in 2010. This bill sought to create a nationwide standard for corporate social responsibility (CSR) and would cut government funding for those corporations who failed to abide. However, after its proposal mining, oil, and gas companies hired over 300 lobbyists to oppose the bill, and it failed by a mere six votes. 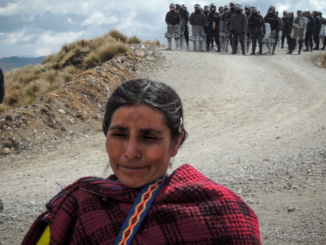 “This is an abuse of authority by the powers of Barrick Gold and the Canadian and Dominican Governments,” says a woman from Las Piñitas. “I say this with full confidence, because no man, woman, or child should be afraid to tell the truth!” Community members continue to speak this truth as they occupy the space out front of Barrick’s Pueblo Viejo office demanding relocation for community members. Klaire Gain is a Masters student in the Social Justice and Equity studies program at Brock University. She utilizes an Ecofeminist framework to investigate the impacts of Canadian mining companies within Latin America and the Caribbean. Klaire visits the communities neighboring by the Pueblo Viejo gold mine twice a year and brings home their narratives and experiences to share with Canadians and promote mining justice. All of the quotations within this article are direct narratives from footage obtained and communication with community members. Dominican Today. (2014) People near Gold mines test positive for Cyanide.